Falling in Love DSP | Stampers With Altitude!!! Here’s an adorable way to ask your bridesmaids and maid/matron of honor to be part of the wedding party! Pull off the cork, pull up the “note-in-a-bottle” and unroll the note!! The bottles around just over 2″ tall. So tiny and so cute! It will be hard to resist becoming a bridesmaid when she unrolls her note…. I have more wedding ideas coming your way! Stay Tuned. …and groom! This is the last card I made with the Mega Mosaic BG technique. I think that it’s my favorite of the bunch. Now that you have seen all three cards, which one is your favorite? I had a blast with this technique. It’s not difficult (‘cept when you don’t keep track of the pieces) and it makes 3 cards! I would love to see what you create! Here’s the second card that I made with the Mega Mosaic BG technique. I have one more card for you tomorrow. But look at yesterday’s card and today’s. They are similar but VERY different. I like any technique that makes me more productive, don’t you? I got three cards done in a short time! I just had to figure out how to cover up my mistakes! (Like I said yesterday, be careful with your pieces.) I think that this is my favorite of the three. Is it? Hm…. I will think on that and let you know. My fabulous upline has released another challenge. This one was a little more than – Stamp. This one was, in essence, find a technique you have never done before. 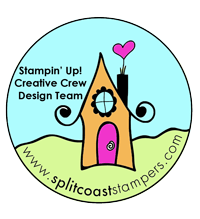 When looking for ideas, I go to my old stamp-by (pun intended) Splitcoast Stampers. I found a thread called TLC591. Basically, it’s take 3 pieces of paper, cut them up 4 – 6 times at the same time, then make a background for your card. Ok. They warned me. Be careful. Eh, what can I say? I thought I was being careful. I moved from the cutting table to the desk and something happened! LOL. The pieces don’t quite fit right. Anyway!!! I know I told you that I would try and get away from this color combination. Eh, that was so yesterday! I am back to it! I have two more cards to share with you and they are also in the same color combination. I promise…. after I post those two, I will TRY again to move on to a new color combination! TRY being the operative word! Of the three cards, I think this one is my favorite. What do you think of this card? Anyway, I ran downstairs to my craft room and stamped this little beauty. NOW that the Occasion’s Catalog is out, I can post links again for you for the supplies.